I have to be at work early, so we’ll keep it mercifully short today. This week’s Sunday interactive playlist will take the form of a short and completely inane quiz. If, like me, you’re really too indecisive to choose your favorite anything, or if you think the concept of picking a favorite anything is childish and futile, just go with the first thing you think of. If you find any of the questions particularly stupid, feel free to skip them (I could skip the whole damn quiz if I liked! I can hear you saying.) Anyway, here goes. You can add the songs to the list yourself (it’s interactive!). Or you can leave a note in the comments, and I’ll add them myself. A song about your favorite abstract concept. I’ve made yeasted chickpea flour flatbread before, I realize that, and I’ve already told you all about it. But this version is different. It has an egg in it, and some baking powder. This makes it more like a pancake, and makes it both lighter and richer. It has a nice lacy soft texture. I made it to go with some collards and roasted sweet potatoes, but sadly I burnt them, so we ate it with pasta and red sauce, which Malcolm made for us. Here’s a link to the interactive playlist. Combine the yeast, sugar, and 1/2 cup water in a large bowl. Set in a warm place for about 15 minutes, to get foamy. Stir the egg and olive oil into the yeast mixture. Add the dry ingredients and stir well. Add about 1/2 cup warm water. You want a consistency like thick pancake batter. Beat for about half a minute, then set aside in a warm place for about 1 hour to get bubbly. 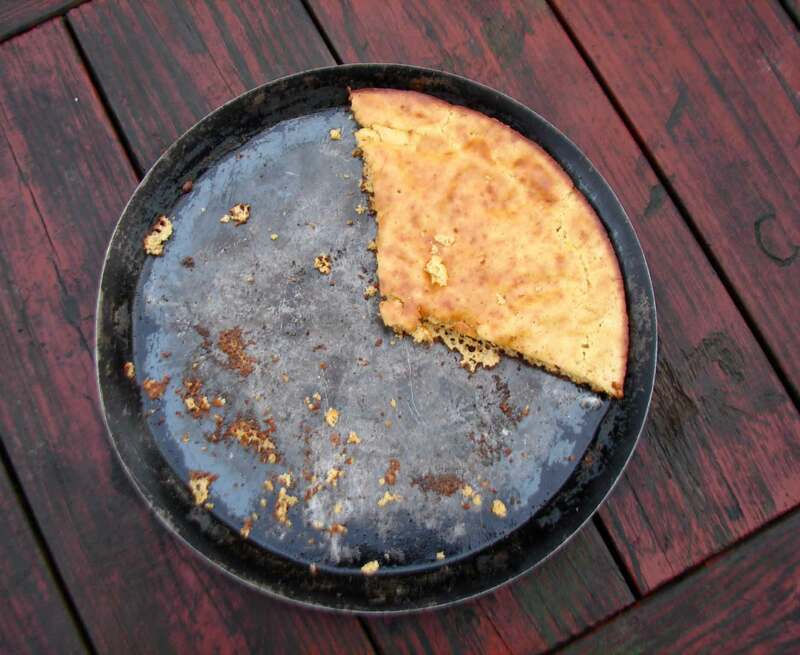 Lightly coat a medium-sized baking tray with a short rim with olive oil. You could probably use a large baking tray, and just let the batter spread as much as it needs to (like a pancake) or even use a pie plate or a cake pan. Pour the batter into the oiled tray, and leave it to set while the oven preheats to 425. Bake for 20 – 25 minutes until the bread is browned and firm to the touch. Let cool slightly, slice and serve. 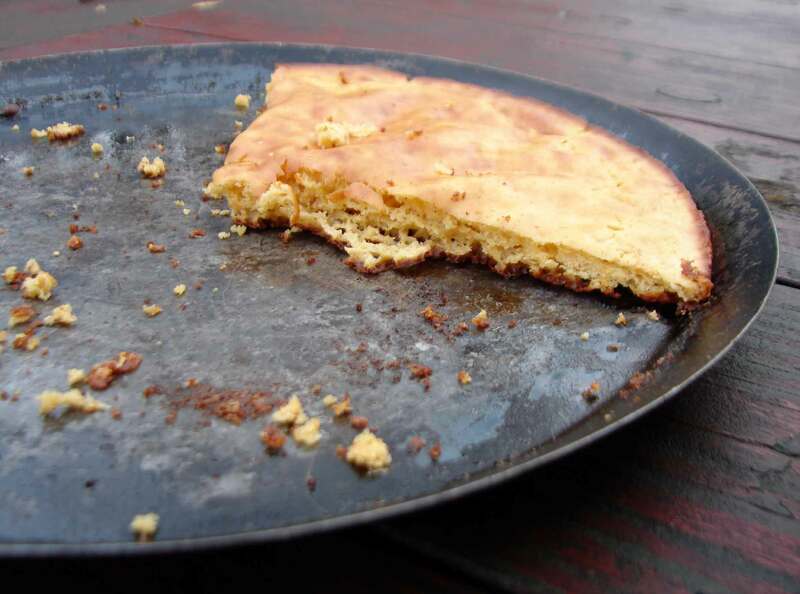 This entry was posted in bread, recipe and tagged besan, chickpea flour pancake, socca, yeast chickpea flour, yeasted chickpea flour cake by Claire. Bookmark the permalink.